Keep your head and neck comfortably dry with this wide-brimmed waterproof fishing hat. Stay protected from rain or rays. This versatile hat is constructed from a breathable DWR-treated performance fabric, incorporates sealed seams, and sports a 3"-wide brim to shed water or provide needed shade. Stay cool and protected from harmful UV rays with this wide-brimmed fishing sun hat. We love this hat for summer fishing on the salt flats as it allows you to stay in the shade regardless of the sun overhead. 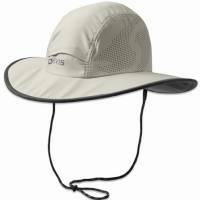 Along with the extra wide brim, this sun hat incorporates UPF 40+ sun protection. 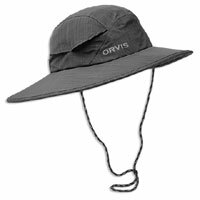 The buoyant brim ensures it won't disappear if an errant gust whisks it away. While the traditional service station may have gone the way of gas guzzlers and pump attendants, the spirit lives on in the men's retro ball cap. 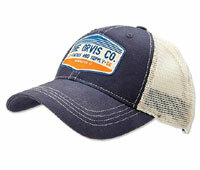 Inspired by a classic gas-station logo, the cap could easily be mistaken for a vintage find. Plastic snap-back closure. In navy. One size fits most. Cotton/polyester. Hand wash.